Vodafone UK has warned iPhone 4S users not to upgrade to Apple's iOS 6.1 software. The network has sent a text out to subscribers telling them to hold off until Apple fixes intermittent issues relating to 3G internet performance the ability to connect to the network at all. Placing the blame firmly at Apple's door, Vodafone said that Cupertino is working on a solution, although Apple has not confirmed any issues or admitted it is trying to fix said issue. 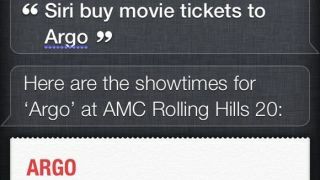 iOS 6.1, brings improvements to Siri allowing users to purchase movie tickets as well as individual song downloads in iTunes Match, was launched last week, but this is the first we're hearing of any problems. In a post on the network's website, Vodafaone said: "Some customers may occasionally experience difficulty in connecting to the network to make or receive calls or texts or to connect to the Internet. "Apple is working on a solution to their software issue. These connection problems are intermittent. "While Apple's investigations continue, we would recommend that anyone who has not yet installed iOS 6.1 on their iPhone 4s should delay doing so until Apple has confirmed that their problem has been fixed."